To give a demonstration on how the software is easy to use, I will use a CT scan of my own head. After the files are loaded, the software detects the appropriate scan studies that are present. You are able to load multiple scans into a single project. Apply thresholding: Mimics has built in presets for CT bone, soft-tissue, etc. I selected the preset for CT bone. After the thresholding is applied a new Mask is created. The mask shows only bone in the scan. Edit mask in 3D: Before i create a new 3D mask, i can edit my current mask to make changes such as removing unwanted pieces and cropping the unwanted areas before moving forward. Region Growing: In order to remove floating voxels and detach unwanted bony anatomy, the Region Growing tool is applied. It will preserve only the bone that is desired in the mask. Calculate 3D from Mask: Once the mask is edited the way you need, you will Calculate 3D object from the Mask. The 3D object can further exported into 3Matic for additional changes or exported as an .stl file for 3D printing. [*]Copy-Paste the completed file from 3-matic back to Mimics. Show the contours of the 3D model on the original images. Point out the importance of verifying the accuracy of the part prior to exporting STL. 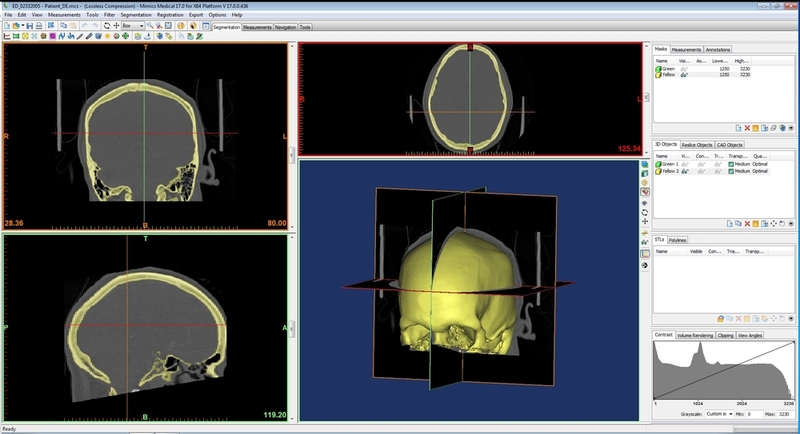 When evaluating software for printing 3D models from patient scans, look at features, cost, compatibility, and ease of use. Ask for a demonstration and trial before purchasing. There are different options for software, it is important to look for one that works with your workflow. I need a CT scan of my head.